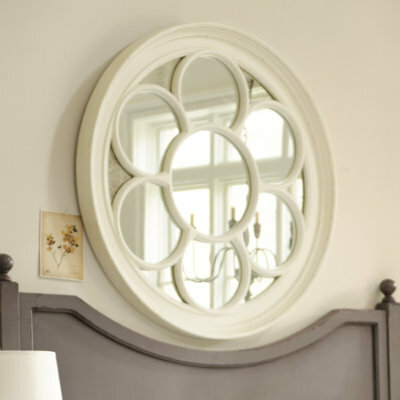 A while back I saw this amazing mirror in the Ballard Designs catalog (one of my favorites). It was this beautiful round mirror and I fell in love. The price however was $300. and considering my budget I knew it wasn't an option. Imagine my surprise (and giddy excitement) when I was perusing the 80% off isle at Hobby Lobby a week later and came across a similar one for only $18.00. This one was black but had a crack in the mirror. I figured for the price I could redo this baby and have new mirror cut to fit. (Don't mind the laundry that needs to be done) You can see the crack on the bottom. It was a fairly simple project once I got the back taken off and pulled all of the staples out that were holding it together. My husband helped me remove the glass as we ended up having to break it. (So that's why our luck hasn't been very good lately! ;) ). I used a sanding sponge to rough up the surface, and on a nice fall day laid it out in the backyard for some spray paint. It took several light coats of paint but they dried really quickly in between. Once that was done I took it to my local hardware store and they were able to cut a piece of mirror to fit. With the mirror in, all it took was a bit of caulk to keep it in place. The hardware store can recommend the right type for the weight of your glass. Now, I'm off do do some more holiday baking! I LOVE this! I miss Hobby Lobby more than you know (none down here)....ugh...and all their after Christmas sales are so AWESOME. Love your blog! How much did the new glass cost you? Your room looks very classy! Thanks Cheryl! The glass for the mirror was about $17.00.